Just because we’re all grown up (well, some of us anyhow) doesn’t mean that the spirit of summer camp is lost and gone forever! In the true spirit of making new friends and learning some fun new stuff (think arts and crafts hour, only substitute fresh ricotta and honey for paste, stinky cheese for play dough, and beer for well, beer!) Jimmy’s no 43 and Saxelby Cheesemongers are hosting a tiny slalom of events this week to set you up proper for the Labor Day weekend. Admittedly, some of it is kinda last minute, but we sincerely hope you’ll be able to join in for a night or two of noshing, tasting, and good conversation in general. You know all about the birds and the bees, but what about the cows and the bees? We love bees almost as much as we love our bovine brethren. Not least of all because the fruit of their buzzing, pollinating labor goes extremely well with butter and cheese! Join in on this casual tasting of local honeys, lead by New York Slow Foodies Amy Thompson and Cecily Upton. We’ll be tasting six different honeys paired with Alleva Dairy ricotta, Evans Farmhouse butter and plenty of fresh baked bread. In addition, two New York City beekeepers, one from the South Bronx and Fort Greene, Brooklyn will be on hand to demystify the business of keeping bees. Learn how honey is made and harvested, compare honey harvested from the same hives during different seasons, and learn about how the recent colony collapse disease is affecting honey production across the country. Ah, the old Brewhaha… it’s chocolaty, it’s cheesy, it’s back in action! Join Saxelby Cheesemongers and the beer whizzes (no pun intended) of New York’s own Homebrewers Guild at Jimmy’s for a tasting featuring the best of Saxelby’s seasonal cheeses, paired with Jimmy’s ever-changing selection of craft beers and a whole slew of delicious chocolate. Why settle on just one vice when you can have three all at once?! Reservations are required, please RSVP to nycdat@gmail.com or call Saxelby Cheesemongers 212.228.8204 to confirm a spot! Enjoy the dregs of summer… they are altogether too sweet to pass up! Volume Two: To Cheddar or not to Cheddar… that is the question. 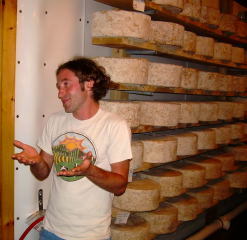 Josh of Jasper Hill Farm (surrounded by wheels of that much coveted Cabot Clothbound Cheddar!) is asking himself this very same question. But I think we can all agree that the answer is yes! I mean, without cheddar where would we be as a cheese loving people? In a dark dark place. That much is certain. In keeping with the tradition of the cheese myths debunked! series, we are here to shed a little light on the old cheddar in the cave. Cheddar is one of the all time most popular cheeses in the history of American cheese. In recent years, mozzarella has usurped the number one spot for most popular cheese in the US (can you say Domino’s pizza, anyone?) however, the kind of cheddar we’re talking about belongs in a league of it’s own. So what is it that makes cheddars different from all their cheesy relatives? In addition to being a most tasty and delectable cheese, the word cheddar is also a verb. It is a part of the cheese making process that lends an uber-creamy and dense texture to the cheese, as well as a plucky, makes-you-pucker sharpness. So, how do you cheddar a cheese? It all starts in the cheese vat. After the curds have been cooked and stirred, all the whey is drained from the vat, leaving a thick carpet of curds on the bottom. These curds mat and stick together, compressed by their own weight and mass. After letting them sit for a little bit, the cheese maker slices this mass of curds into rectangular blocks and stacks them on top of one another. For the next hour or so of cheese making, these blocks of curd are flipped and re-stacked by hand at 15 minute intervals. Why the heck does the cheese maker put himself through this kind of torturous extra work, you might ask? Well for one thing, it’s way cheaper than buying a membership to a gym. And, seriously now, it has everything to do with the end flavor and texture of the cheese! The more the curd is handled, the higher the acidity level goes. For a super sharp cheese like cheddar, this is a good thing. An acidic curd will produce a stronger, prickle-your-taste-buds cheese in the end. After all the flipping and stacking is done, there is yet one more semi-grueling step to complete in order to make an authentic cheddar. The curd must be milled. What the heck does that mean? Well, depending on how big your cheese making operation is, it could mean a number of things. Some small cheese makers will mill their curd by hand, meaning that they cut up those aforementioned blocks of curd into small cubes. Larger cheese operations mill their curd with a machine, which resembles your garden variety mulcher. The blocks of curd are fed into one end of the mill, where they are shredded down into small chunks and spit out the other side. The milling of the curd ensures that the cheese will have a very dense and compact texture, which makes it ideal for aging. After the curd is milled, it is salted directly in the vat and mixed thoroughly through one more time. The curds are then pressed into molds and aged anywhere from a few months to upwards of eight years! The older the cheese, the more thick and compact the texture becomes, and of course, it grows sharper with each passing year. Watch out for those super aged cheddars… they’ll put a hurt on ya! At Saxelby Cheesemongers, we’ve got a little bit of everything cheddar-ish: from fresh cheddar cheese curds from Hillcrest Dairy to cloth-bandaged cheddar from the cellars at Jasper Hill Farm to two-year-old Grafton cheddar from Vermont. So stop on in and make the acquaintance of a tart and tasty cheddar. Your tummy will thank you. It’s 6:30 am and already I’m late! I’m up in Greensboro Vermont, and it’s well past time to start making cheese at Jasper Hill Farm. So, I stumble downstairs to the cheese room and make myself a coffee and get to work. Well, in a relative sense. Somehow emailing seems like a wimpy excuse for work when confronted with all the work happening on the farm. And I find it funny that in New York getting up before 7:00 seems nigh impossible sometimes; but up here it seemed like the only reasonable thing to do. In fact, most of the staff at Jasper Hill arrives around 5:00, so to them, we’re already well past breakfast time. The milk is warming in the vat, and the washing is being done to get the cheese room ready. It’s a lot of washing. Cheese molds, tables, floors, walls, the work never ends! Mateo, Tom, Emily and the rest of the crew are hairnetted and ready to start making some Bayley Hazen Blue. Soon we’ll add some culture to the milk and really get cheesing, so to speak. On the other side of the cheese room, Andy and some other folks are out in the barn, finishing up milking the last of their 40 Ayrshire cows. It’s sunny and beautiful and I am having a tough time reasoning why I should leave Vermont at the moment. Everyone reassures me that come November I’d change my tune, when the the six month winter is well underway. But for now, it’s paradiso! The American Cheese Society conference was a wonderful dairy cacophony of butter, goat cheese, sheep cheese, cow cheese, chocolate cheese (?!) cheese spreads, and innumerable other cheesy comestibles. We found some real gems to bring back home to New York, so keep a look out for plenty of new cheese over the next couple of weeks. But for now, it’s back to the cheese room. I’ve got to get my hands in some curd while I’ve got the chance. In three months, Mateo will send this batch o’ blue down to New York, and you all can evaluate our cheese making skills! It’s a bird! It’s a plane! 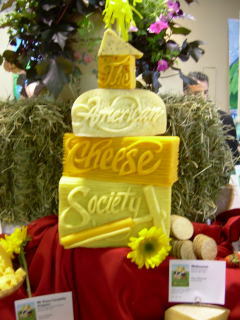 It’s a sculpture made completely out of cheese!!! Yes, we are a bunch of dairy geeks. Hear us roar. So, last week we were up at Jasper Hill Farm, making delicious cheese and communing with the cows. But, we were also eating lots of cheese at the American Cheese Society Conference and picking out some gems to share with the likes of you all! A big old wheel of raw cow’s milk cheese that has been aged for about six months. Mecox Cheddar is not your garden variety stuff. (reference photo above to see what Mecox Cheddar is NOT) Nay, it is an entity unto itself. The texutre is pliant, snappy, and creamy, reminiscent of much younger cheeses. Mecox Cheddar is characterized by fruity and nutty flavors, and has a bit of that swiss cheese acidity that tickles your nose as you munch on it. A gorgeous cheese to tote along on a picnic or to savor on a hearty hunk of toasted bread. Caroline Hillman’s cheeses are back! After a long winter and chilly spring the goats are up and ’em, and the cheeses are cave aged and ready to go. This year’s first offering is the Hilltown Wheel, a three to four month old goats’ milk cheese with a smooth and supple paste and a hint of lemon meringue citrus flavor laced in betwixt the musky goatier notes. A second prize winner in the farmstead category at the ACS! This unique and sweet mixed milk cheese (cow and sheep, unite!) is a true joy to snack on. The rind is carefully washed with salt water brine as the cheese ages, producing a mild and slightly earthy flavor. Timberdoodle is aged just about two months, and the resulting cheese is toothsome, buttery, and oh so slightly sheepy. Try it out with some heriloom tomatoes and spicy olive oil in a summer salad. You won’t be dissapointed, trust me.